It has been 3 years, almost to the day, since famed boy band One Direction performed at BC Place in Vancouver. Now disbanded, the individual members have spent the last couple of years growing their own careers. Sitting near the top of the pack is English singer Harry Styles, who released his self-titled solo debut back in mid-2017. He has carried over a ferocious fan base that was out in full force at Rogers Arena on Friday night. I stood out in the stands, among the fanatics, watching an animated video of what were presumably Harry’s hand playing with a Rubix cube on an enormous stage-wide screen. Every time the lights would dim, even slightly, the eager crowd would roar with a single, unified, soul-piercing scream. The house lights finally did turn all the way down and the animation disappeared, and one final, welcoming, guttural scream blasted from the audience. I have been to some loud concerts over the years, but that yelling was one of the loudest things I have ever heard. It shook my core. Harry stepped out on stage and kicked things off with his song “Only Angel”. Wide-eyed devotees stared longingly at the musician belting out the lyrics along with him. The young singer was always smiling, clearly loving what he was doing and elated by the audience reaction, which is surely commonplace at any one of his given shows but still seemed like a genuine reaction on his part. He is still humbled by the support and love, which is always touching to see. 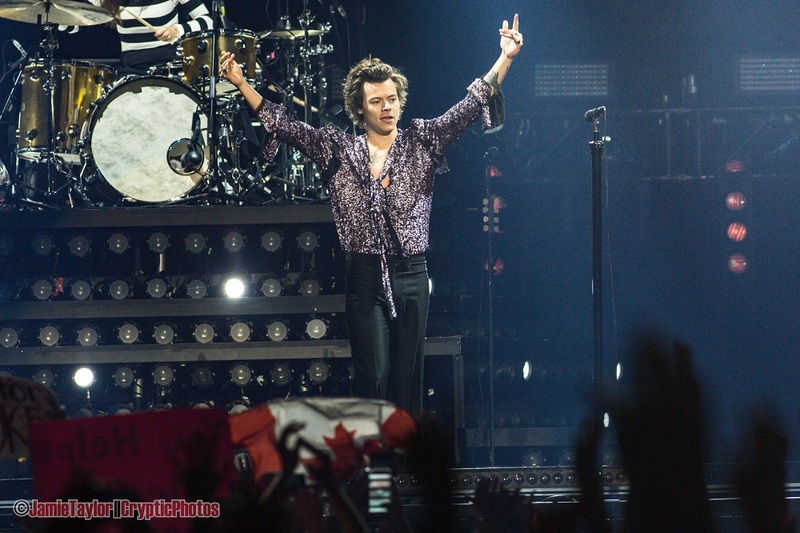 Mr. Styles had a full backing band with him and strutted around before them in his shimmering seventies-inspired shirt. I was impressed with the entire set, even though for the most part the musician’s vocals were drowned out by the enthusiastic fans committed to singing along. He powered through his solo hits, adding in some One Direction chart-toppers in “Stockholm Syndrome”, “If I Could Fly”, and “What Makes You Beautiful”. During the encore, he covered Fleetwood Mac’s “The Chain”, which was beautifully delivered. Looking back, the entire performance was exciting and brimming with energy. Harry has a way of captivating his audience and committing himself to the entirety of the show. His love for what he does and love for his fans is so very obvious in everything he is on that stage. He may have been born from a Simon Cowell orchestrated boy band, but he is truly an amazing talent on his own. He deserves the praise and he earns the applause. Thank you to Harry Styles for a wodnerful night out. I look forward to the next time you return to Vancouver.